A playground surface made of recycled rubber does not decompose or blow away. It is non-toxic and does not harbor insects or mold. With innovative tools, technologies and processes, Liberty Tire Recycling is a leading North American conservation enterprise. For nearly two decades, we have been dedicated to finding new and better ways to RECLAIM, RECYCLE and REUSE scrap tires as the base of innovative, useful products. Our efforts divert more than 150 million end-of-life tires from the waste stream, contributing to the well-being of communities and long-term health of our planet. In particular, abandoned tire piles are a serious environmental concern across the country. 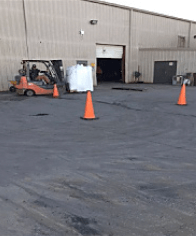 Liberty Tire Recycling works with communities to remediate abandoned and unhealthy scrap tire piles: to date, we have remediated more than 150 dump sites littered with nearly 40 million scrap tires. Learn more about how tire recycling contributes to a greener planet. Q. How does tire recycling tie into broader green initiatives? According to the Institute of Scrap Recycling Industries, the industry recycled more than 130 million metric tons of materials in 2015, transforming outdated or obsolete scrap into useful raw materials needed to produce a range of new products. Scrap recycling creates and supports jobs and positively impacts the environment by reducing greenhouse gas emissions, saving energy and protecting natural resources. Tire recycling plays a major role in the scrap recycling industry, with Liberty Tire Recycling alone saving 150 million tires from the waste stream each year and reclaiming 2.2+ billion pounds of material annually. Where does Liberty Tire Recycling get scrap tires? Tires of every shape and size are collected from a vast lineup of customers at more than 60,000 locations nationwide, including new tire retailers, automotive service centers, government institutions, military facilities, car dealerships and tire wholesalers. Also, Liberty Tire has remediated more than 150 dump sites littered with nearly 40 million scrap tires during the past seven years, exceeding any other organization in the nation. How does Liberty Tire Recycling collect scrap tires from customers? Liberty Tire provides a complete service profile of collection options, including backdoor pickup, drop-and-hook pickup and drop-off sites. Box vans visit customer sites directly, removing scrap tires by hand on a periodic basis, or Liberty Tire leaves a bulk trailer for customers to fill at their convenience and takes the load away when full. Also, tire deliveries are accepted at any Liberty Tire facility. How are metals and fiber materials removed from scrap tires? After tires are processed, Liberty Tire Recycling removes and collects scrap steel with magnets and separates fiber components with air classifiers. The result is clean recycled rubber. What is the market for recycled rubber from scrap tires? The market potential is broad-based because recycled rubber makes many products and materials already in production even better. Rubber asphalt is safer and longer-lasting than traditional asphalt. Rubber mulch outperforms wood mulch. Tire-derived fuel is cleaner than fossil fuels. The examples go on and on. And, in the end, recycling rubber keeps millions of scrap tires out of landfills each year, making the entire process a true green alternative. Members of Liberty Tire Recycling’s Health and Safety Team meet in the hotel lobby at 4:30 am to finalize the schedule for their visit to the Baytown, Texas facility. 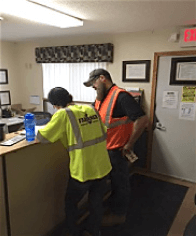 At the facility, they check in with site security and assemble in the common area to help the local team facilitate morning safety meetings, a pre-shift facility walk-through and the Stretch and Flex Program. Six separate safety meetings will take place today. Later that week, operations will be shut down for a day for the Operation Clean Sweep Event, in which the safety team and all site employees spend the day cleaning the entire facility. 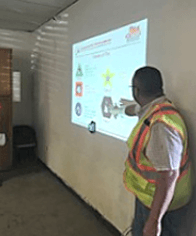 Our Health and Safety Team completes a comprehensive review of the fire prevention, detection and response systems at our Salt Lake City location. The review was completed as a group activity and continued over several days. Jim Gilbert, Facility Manager, led a final walkthrough of the facility to review all systems procedures and proper protocols. Our safety system continues to focus on proactive measures, as described at the Baytown facility. Research suggests that 90% of all injuries occur because of lack of knowledge, shortcuts and/or poor decisions. Recognizing this, our Health and Safety Team focuses on hands-on, practical employee training, hazard recognition, behavioral observations, suggestion programs, coaching effective safety committees, and if there is any doubt, employee Stop Work Authority. Many individuals in leadership positions at Liberty Tire Recycling were previously facility owners and have 25 years of experience in the industry. They understand the tire recycling process and have insight into operations, specific equipment, potential hazards and risk management. 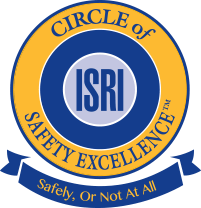 Our Health and Safety Team recognizes this unique aspect of the company and works closely with leadership to share knowledge and best practices to implement a solid safety program. Safety awareness and development for employees starts on their first day on the job. Everyone completes a documented, comprehensive new hire orientation, which includes a message from the CEO, facility introductions, classroom instruction, facility walkthroughs, site-specific safety videos filmed on location, quizzes, a Q&A session, and assignment of a “friend” who works a similar position. Safety awareness and development for employees starts on their first day on the job. Everyone completes a documented, comprehensive new hire orientation, which includes a message from the CEO, facility introductions, classroom instruction, facility walkthroughs, site-specific safety videos filmed on location, quizzes, a Q&A session, and assignment of a “friend” who works a similar position. Each employee at Liberty continually strives to implement “best-in-class” operating systems.